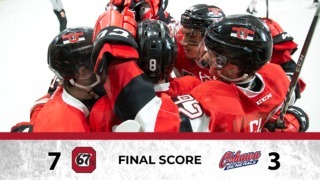 The Ottawa 67’s have booked their playoff berth and will be now looking to rake in the required points to gain home-ice advantage for the opening round. 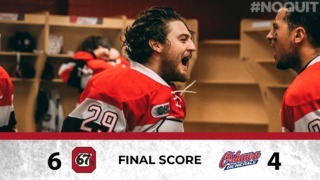 There are just six games left in the regular season and just five points separate the 67’s from Oshawa Generals in fourth place in the Eastern Conference. A strong performance in the coming two weeks by the 67’s could see them improve their ranking and earn a more favourable matchup in Round 1. The Barber Poles have had a strong run since the start of 2018, turning on the afterburners last month. Since February, the 67’s produced a 9-5-0-0 run, including a six-game winning streak, scoring 53 goals during this period. 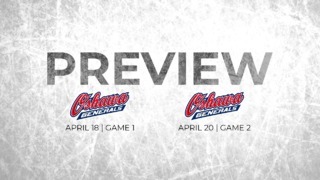 On tap for this weekend is a home-and-home series against the Kingston Frontenacs followed by a home date with the Mississauga Steelheads. Among the six games remaining, the 67’s will play three games at The Arena at TD Place, including a pair this weekend. The Frontenacs and the 67’s have had close battles during the eight times they have met this season. The 67’s have a 3-4-1 record against the Frontenacs this season. The battles have been high-scoring affairs with a total of 49 goals being scored by both teams in those eight games. The Frontenacs are currently third in the Eastern Conference and are in a strong position for a home game in their playoff opener. However, they have struggled of late, having won just one out of their last six games. The Steelheads are currently in eighth place in the Eastern Conference, three points below the 67’s. They are 11 points ahead of the Peterborough Petes in ninth place and are in a strong position to claim the last playoff spot in the East. They have won five out of their previous seven games though they are yet to defeat the 67’s this season. This will be third meeting between the two sides this season with the 67’s having won 6-2 and 4-3 in the previous encounters. Tye Felhaber needs three more to reach 100 games for the 67’s. He can achieve that this weekend. Felhaber is playing well, having scored points in five consecutive games. Sasha Chmelevski, the top scorer for the 67’s, has scored points in eight consecutive games. 67’s captain Travis Barron has scored goals in his last three games. Kody Clark needs two more to hit 50 OHL career points.